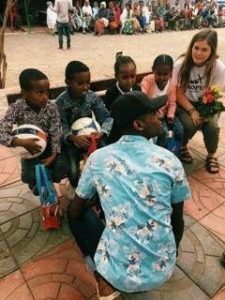 One of the biggest fans of Hope College women’s soccer lives in Ethiopia. And some of the biggest fans of 12-year-old Sam Shebabaw reside at Hope. Never mind that they are separated by an ocean and a continent. Never mind that they are different in gender and social class and culture. Never mind any of that. Because, you see, they don’t mind any of that. Sam Shebabaw of Addis Ababa, Ethiopia and the Flying Dutch, of Holland, Michigan, are undeniably bound together — by soccer and by hope. 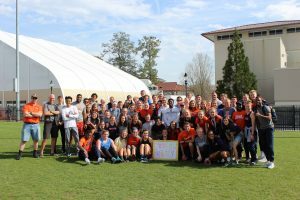 Since much of the ethos surrounding the Hope women’s soccer emphasizes servanthood — not just toward teammates but also to those beyond their immediate reach — the team has supported various charities domestically and abroad for many years. For the past six years though, the Flying Dutch have focused all of their resources on Sam, a child under the care of YZM USA, an Ethiopian non-profit, non-government organization providing comprehensive care for orphaned and vulnerable children in multiple communities in and around the capital city of Addis Ababa. Becoming connected with Sam Shebabaw started in 2012 when Madison Buursma ‘15, currently a Ph.D. candidate in nursing at Michigan State, was a member of the Flying Dutch team. Maddie told head coach Leigh Sears about her family’s involvement with YZM USA. Her father, Tim Buursma ’87, is on their advisory board, and the Buursmas adopted their son and brother, also named Sam, through that agency in 2011. Shortly thereafter then, the Flying Dutch chose to support one charity — YZM USA — for the foreseeable future. “The team decided we would sponsor the youngest kid that we could and keep supporting him or her until the age of 18,” says Sears. 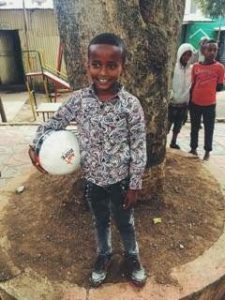 As a consequence, every player on every Hope women’s soccer team has donated toward Sam’s annual support since he was six; for food, clothes, hygiene supplies, and his education, including a school uniform. 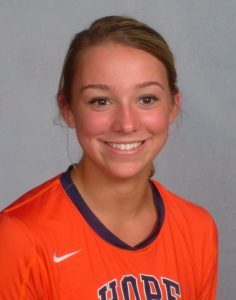 But Morgan Buursma — sister to Maddie and Sam Buursma, daughter of Tim and Dawn Buursma, and a senior player for the Flying Dutch — is quick to point out that the total money the teams sends to YZM USA doesn’t go to Sam alone. “There’s over 1500 kids in this organization and about 500 aren’t sponsored. So, donations get distributed throughout, but Sam is our main guy there,” she says. Each time she has met Sam Shebabaw, a message of God’s global reach hits home. Morgan Buursma, far right, and Sam Shebabaw, far left, in Addis Ababa, Ethiopia. In her captain, Sears sees a young woman who plays and learns with a great deal of perspective and effort. That’s a winning combination for life, no matter the sport or major. “She’s a good student taking difficult classes. She’s a great kid from a great family. She works really hard and leads by that example,” the coach says. So, Sam Shebabaw of Ethiopia wears his jersey and delights that women soccer players in America are some of his biggest fans. He writes to the team twice a year, and the Flying Dutch write back. Half a world away from each other, they’ve been brought closer together by hope. My name is Steve Binnig. 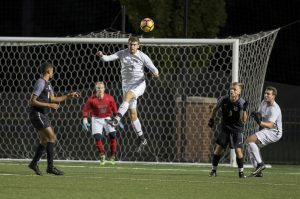 I am a senior from Pittsburgh, Pennsylvania and am a member of the Men’s Soccer team at Hope College. Here is a piece of my story. On Tuesday January 8th, 2018, the second day of classes of my second semester of junior year, I woke up in a panic attack. Up until that moment, I had never experienced a panic attack before. Frankly, I had never really had anxiety before. For the first time in my life, I did not think I was going to be able to bring myself to get out of bed. For the rest of the semester, everyday tasks like going to class, grabbing lunch with my closest buddies, and hitting the weight room suddenly felt impossible to accomplish. My brain felt like it was running at a million miles an hour. I could not make sense of my thoughts, feelings, or emotions. Again, this entire experience was new to me, and for all intents in purposes, made no sense. Let me back track a bit. I come from a great family. I have a set of parents who love God, love each other, and love my sisters and me more than anything in the world. I have a lot of friends. I have an awesome girlfriend. I do well in school. I have a bright future… so why in the world did I have any reason to panic? While I don’t know exactly what the root of this initial panic and anxiety was, what I can tell you is that the days since January 8th of this year have been hard. Some days have been downright terrible. I have had to do some things that were, at first, really uncomfortable. It started with a conversation that same Tuesday between me and two of my closest friends, Hayden Smith and Tucker Marty. I told them what I was experiencing, and that I had no idea how to stop it. Hayden and Tucker are two understanding and compassionate people, but it is still incredibly difficult to open yourself up like that to others. Luckily, they encouraged me to reach out to my family, my girlfriend Holly, and a few others I consider my closest friends. To set the record straight, I have never had a hard time articulating my thoughts and feelings. I am a verbal processor, and I enjoy working through the thoughts in my head with others. But, attempting to make sense of my brain on that Tuesday felt undoable. That being said, I could not be happier that Hayden and Tucker encouraged me to speak up. Consequently, for most of this calendar year, I have been going to regular therapy sessions and been prescribed different medications to treat General Anxiety Disorder and Panic Disorder. I have seen my support system rally around me in ways that I did not think were possible. Bottom line, I got, and am continuing to receive, the help that I need. Now, enough about me. What does this mean for you? Allow me to clear the air: this is not a pity party. I am not asking for your sympathy. Save it. What I am asking is for you to consider your current and past perspectives on mental health. Prior to this happening in my own life, when trying to understand someone dealing with mental illness, I would think things like, “Why can’t you just turn it off?”, or “Just get over it already.” Maybe I am just a cold-hearted individual, but my intuition tells me that a friend, family-member, or complete stranger has led you to think these things at least one time or another. Maybe, it’s been thoughts about yourself in your own head that have led you to feel this way. As an athlete, I get it. For as long as I can remember, I have had coaches, teammates, parents, mentors, etc. teaching me what it means to be, “tough.” Tough, in this case, means that to show even a glimpse of weakness would make one a failure. Athletes are conditioned to be tough. From the way we train, to the way we play, even in the way that we relate to others… the best athletes are the toughest ones. Fear not, I am not about to dismantle the idea of athletics. I have learned many of my most valuable life lessons on the soccer field. I believe that through sport, we gain invaluable skills that carry over into our day-to-day lives. But do not miss this. I also believe that in our culture, specifically in the sports world, we have created an environment where athletes are discouraged to speak up about their internal battles. That needs to change. If I have learned anything from battling mental illness it is this: Tough does not internalize. Instead, tough works through the messiest parts of life and faces its hardest trials head on. Tough asks for help when help is required. And most importantly, tough never, even when it seems absolutely impossible to keep moving forward, gives up. All things considered, we attend a school that offers both a safe and welcoming campus. Speaking from my own experience, staff and faculty at Hope actually want to know their students. They care about us, and that is not the case at a lot of institutions. However, I understand that fact does not necessarily make it any easier to seek out the help you need. If I’m honest, one of my biggest fears in this whole thing was that my family, friends, and mentors would consider me a “bad Christian” because I was dealing with anxiety, panic and depression. In my head, I was convinced that no “good Christian” would struggle the way that I was struggling. Hear these words that I have had to tell myself repeatedly over the last several months: that is a lie straight from the pit of hell. There is no such thing as a perfect person, let alone Christian. We live in an imperfect world, full of sin, sickness, hardship, poverty… the list goes on. We, as people are inherently fallen and sinful. As a result, things like anxiety and depression exist. My point is that one of the first steps in confronting mental illness is recognizing that struggling with anxious thoughts, panic, depression, thoughts of suicide, self-harm or whatever is not abnormal. It is simply another negative byproduct of our fallen world. As Kevin Love recently stated in his article by the same name, “everyone is dealing with something.” Remember, no man is an Island. My goal is to get people talking. Friends talking with friends, students with professors, departments with other departments, athletes with non-athletes, Sibs with Delphis, baseball players with football players, community members with Hope students. You get the point. The people of Hope are too valuable to struggle on their own. We are blessed with too strong of a community to allow one another to fight our demons independently. No, I don’t have the answer. But, I do know there needs to be change. If nothing else, I am here to tell you that mental illness is very real. I am ashamed to say that I would not have said that a few months ago. It is no secret that there is a negative stigma that surrounds mental health in our country, and I have been guilty of contributing to that stigma in the past. The important piece moving forward is that we can debunk the idea that the person inflicted with mental illness is weak, incapable, crazy and/or a failure. Speak up. Whether for yourself or for someone you love. Speak up. I can’t promise it will be easy, but I can promise it will be good. Alexis Thompson ‘17 would not quit. It was not even a consideration. Sure, her interview process was arduous — 11 interviews in all for Stryker Corporation, a leader in medical and surgical equipment and supplies — but she was used to hard work, to tenacity, to playing until the final whistle. 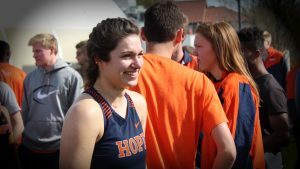 Those were lessons, Thompson says, she learned well after four years earning her degree and playing a varsity sport at Hope College. So for three months of interviews that ranged from the traditional sit-down question-and-answer sessions with potential bosses, to meetings in hospitals with potential clients, to taking a Gallup® StrengthsQuest test, to writing an essay about perseverance, to delivering a mock sales call, Thompson never gave up. And because she did, she is now a trauma sales associate for Stryker — named on Fortune magazine’s Top 100 Best Places to Work at #16 — and her sales territory is the east side of the state of Michigan. Sports, it’s often been said, build character. But they do even more than that. “Stryker is very adamant about maintaining a high-performing culture,” says Austin Brancheau ’12, also a Hope graduate and Thompson’s direct report. “I don’t think it’s a secret that our interview process is very selective and lengthy. It’s about finding the right people to fit in on the right team. Sports, it’s often been said, build character. But they do even more than that. 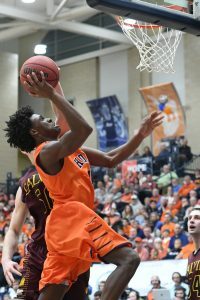 Playing a sport, especially at the college level, builds a strong and dogged work ethic for those who wish to pursue excellence. 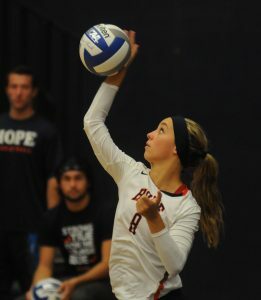 While Thompson may have come to Hope with some understanding of that work ethic, she believes it was clarified and embodied further in Hope volleyball. 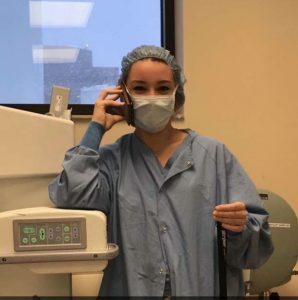 As a trauma sales associate, Thompson not only makes sales calls to introduce surgeons and medical staff to the latest medical device innovations offered by Stryker to better treat patients, she also supports those medical personnel who use Stryker products when they are in the operating room. As surgeons repair broken bones or replace hips and knees, Thompson is with them in surgery to provide technical support. If there are any questions regarding Stryker instrumentation, she provides operating-room-ready solutions during surgeries that can be as short as 40 minutes or as long as six hours. Though she first came to Hope to be a nursing major, Thompson changed her mind as a sophomore and majored in business instead. Her goal from then on was to work in a business in a health-related field. And that is why she persisted to become a Stryker employee. The former volleyball player felt it was the best place to use all of her Hope-taught talents and skills. And, no doubt, in life. 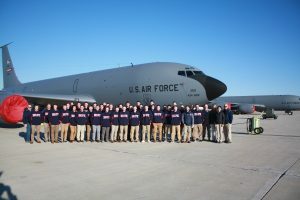 As their bus pulled into Grissom Air Force Base, through the fence barrier and approved at the guard post, members of the Hope College baseball team could not help but feel a sense of real wonder. Before them, upon acres and acres of practical Midwest land, stood an operational military base with miles of runways and dozens of no-frills buildings. Airmen saluted and marked military vehicles whizzed by. Large aircraft stood in august readiness in the distance. If it wasn’t blatantly clear to 31 Hope baseball players on board that bus prior to entering the base, it was now: This was not a typical team trip. The stopover at Grissom was unique, yes, but not unexpected. It was an excursion arranged weeks earlier by Hope Coach Stu Fritz and Hope alum, Lieutenant Colonel Matt Garvelink ‘96. 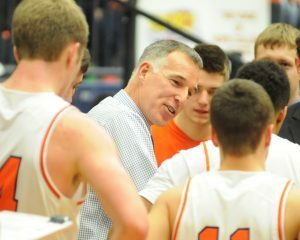 The Flying Dutchmen were on their way to play Hanover College on the second Saturday of March, and Grissom AFB is on the way, right off US31 in Peru, Indiana. For the past two years, Garvelink has invited the Hope team to stop in and visit the place where he’s been stationed since 2015. Together with Garvelink and other military personnel on base, the baseball players eat a meal in the dining hall, then sit a spell and learn how a national team practices tenacity, commitment, accountability, trust, loyalty, and leadership for the sake of others. Is there a better place to hear about large-scale dedication to tenacity, commitment, accountability, trust, loyalty, and leadership? Is there a better place to hear about large-scale dedication to those values? With each visit the Hope baseball team has made to Grissom, transformational lessons unfold into a transformational experience. Like Carrasco, senior captain Landon Brower of Holland, Michigan (Holland Christian HS), has learned Grissom lessons for baseball and life. A biochemistry/molecular chemistry major, Brower has plans to enter dental school after graduation. He admits his life trajectory has been singularly focused; he’s never considered any other educational or career path. “But then I hear Lieutenant Colonel Garvelink’s story and I’m impacted by being with people who take different pathways and have so much success in different life experiences,” Brower reflects. Garvelink’s story is a compelling one, a tale of following a calling to a military career only after obtaining a bachelor’s degree from Hope in biology with secondary education certification. Garvelink, who grew up in Holland, Michigan, taught for a year as a substitute teacher after graduation, but he felt a new nudge toward a totally different direction. 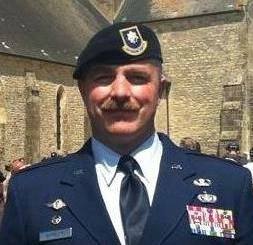 So he enrolled in and graduated from Grand Valley State University with a degree in criminal justice and then entered Air Force Officer Training School in 2002, graduating as a second lieutenant. Airborne School came next at Fort Benning in Columbus, Georgia. Since then, Garvelink has trained with the Royal Air Force (RAF) in Great Britain, worked contingency response ops out of Germany, been deployed to Iraq five times since 2004, and served in every country in NATO. Garvelink’s leadership style is one for interpersonal priorities, too. “You aren’t a good leader,” he says, “if you can’t tell if your team members have, or have not, brushed their teeth.” He doesn’t mean that he gets all up in their business, though; he means that good leadership happens face-to-face and with relational intention. As he oversees a squadron of 150 full-time and reservist airmen and women as the commander of the base’s defense unit, he stands by the credo that good teams must consist equally of good leaders and good followers. “I’ve seen it ultimately save lives,” he reasons. 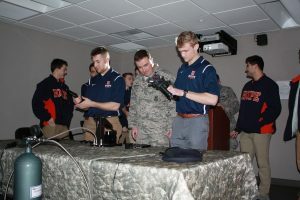 Lt. Col. Garvelink, center, shows Jack Sojka, right, and Cal Barrett, left, pneumatic-powered weapons training simulators. Garvelink passes on this and other pieces of their leadership philosophy to the Hope baseball team every time they stop by Grissom. He’s happy to take the time to not only impart his hard-earned thoughts on leadership but also to show the team technologies of the modern military. It’s a way of giving back and moving forward. 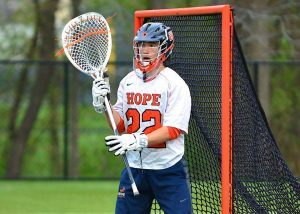 I play lacrosse for Hope, and it’s my absolute joy to wear the orange-and-blue jersey. I also play for another team, and it gives me great pride and pleasure, too. 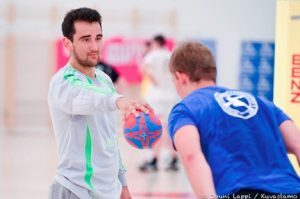 I play team handball for Team USA, and I recently got the opportunity to do so in Croatia. 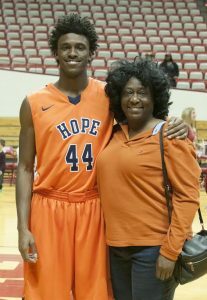 Although my trip was not part of my official curriculum as a history and economics double major, it was an unique educational experience and could not have happened without the support of the Hope College community. I grew up playing lacrosse in the Detroit area but in the summer of 2012, I came upon team handball while watching the London Olympics. 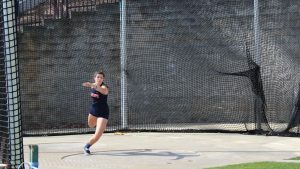 I really liked how fast paced the sport was, and it seemed like something that would help keep me in shape for lacrosse. I did a little bit of research and discovered that the only handball club near me was located all the way in Chicago. Luckily, my family took a vacation to Chicago later that summer, and I found a way to practice with the club. That was my first time playing the sport, and I was hooked! I later formed a de facto club at my high school, Detroit Catholic Central, and continued to play casually with my friends. In the fall of 2014 I heard about an open tryout for the US U21 national handball team in Chicago, naturally I signed up to attend. After a few fun but grueling days, I was put on the reserve team, which is a fancy way of saying I didn’t make the cut. A few months later though, the coach of that team emailed me asking if I’d be willing to play in a tournament in Sweden. Since then, I’ve practiced with that original team in Chicago every few months, and have practiced with another team in Chicago (which is coached by the U21 national team) about once a month, in addition to training with the Olympic team a couple of times. In fact, for most of my coaches and fellow campers, I was the first American handball player they had ever seen. Playing a modified version of tag with my buddies Niclas (Finland), Youssef (Egypt), and Rasmus (Denmark). 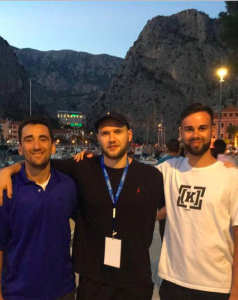 This summer, an opportunity to play in Croatia came about and there was no way I could turn it down. I attended the International Handball Goalkeeper Camp, an annual weeklong training camp in the coastal resort town of Omis. The camp’s reputation has attracted some of the best handball goalkeepers and coaches in the world. To draw a comparison with football, it would be like attending a quarterback camp with Tom Brady, Peyton Manning, and Matthew Stafford in the Bahamas. I was lucky enough to have been accepted to the camp last summer, which made me the first American ever attended. In fact, for most of my coaches and fellow campers, I was the first American handball player they had ever seen. Working on a reflex exercise at camp. Over 90 goalkeepers attended the camp, and about 26 countries were represented. There were two training sessions a day, one in the morning and one in the evening. Each session was led by a coach and player, and would emphasize a different aspect of goalkeeping. Not only were the coaches and players world class, they were also very down to earth and willing to help. 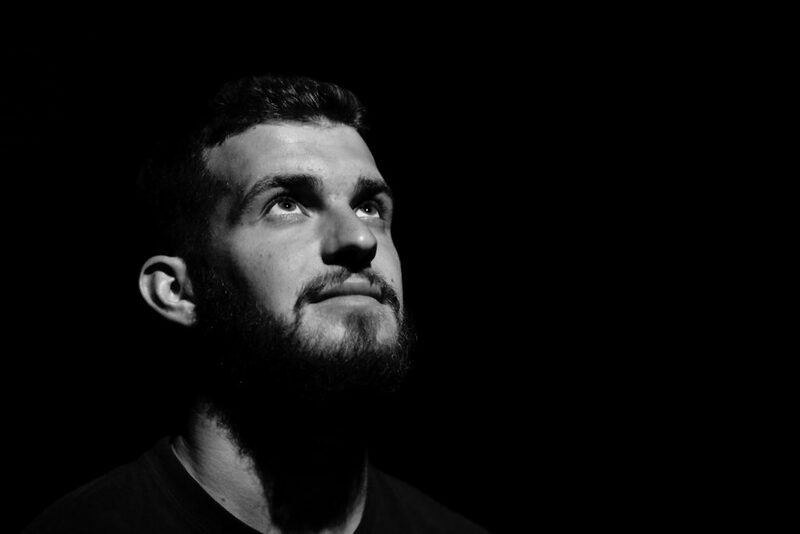 Borko Ristovski, the goalkeeper for Macedonia’s national team and Barcelona, would stay after every session and shoot penalty shots with younger goalies. Roland Mikler, the national team goalkeeper for Hungary and one of my favorite pro goalies, was at nearly every training session and gave specific feedback to the athletes. My training partner one day might be a professional goalkeeper from Egypt or a nearly 7 foot tall athlete from Finland. Hearing these different viewpoints gave me a more nuanced understanding of how the U.S. is perceived by different people and gave me the chance to represent the United States to these people in a personal way. Walking around town with my friend Eske, from Denmark, and Dan, from Spain. I may not have many things in common with someone from Denmark or Croatia, but on the handball court, we were able to start a dialogue that carries into mealtime and rest time (luckily, almost everyone spoke fluent English). Most of the conversations would take place in the hotel’s pizza shop. I was amazed at how naturally a conversation about handball could transition into a profound dialogue about topics like the refugee crisis. Perspectives from Sweden, Spain, Germany, Denmark, Egypt, the Netherlands, and the United States would each be presented in these conversations, which were always civil and sometimes light-hearted. Hearing these different viewpoints gave me a more nuanced understanding of how the U.S. is perceived by different people and gave me the chance to represent the United States to these people in a personal way. While the technical aspects of the International Handball Goalkeeper Camp were immeasurably valuable, the opportunity to make friends from all over the world is what I cherish about time in Croatia. Hope College has provided me with both the support and education that allows me to get the most out of my experiences playing handball abroad. 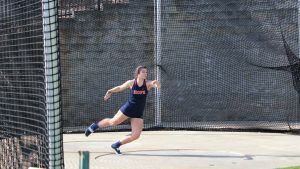 In the athletic department, I have found tremendous support as both a varsity lacrosse player and an aspiring handball player. Hope’s Head Lacrosse Coach Michael Schanhals has been particularly supportive of me both as an athlete and person. 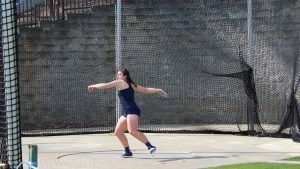 At great cost to the lacrosse team, he allowed me to travel to Paraguay during spring break (when our lacrosse team was in-season) so that I could compete for Team USA in the Pan-American Championships. He has also been one of my biggest advocates and biggest role models. My unusual hobby has been a unique educational tool. 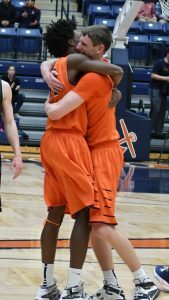 Thanks to my education at Hope College, I am better able to reflect on world-wise experiences because of a world-wide sport. 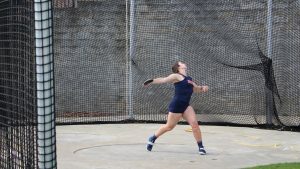 Other coaches, like Becky Schmidt, Chad Carlson, and Melinda Larson, have been incredible mentors and have helped anchor me as both an athlete and a Christian. Academically, I have been blessed with very patient and helpful advisors in both the History and Economics Departments. Professors Marc Baer and Gloria Tseng have helped me improve as a historian and have fostered my love of history and writing. Professors Todd Steen and Stacy Jackson of the Economics Department have also been extremely accommodating and supportive of me, which I have always appreciated considering that I’m not the most talented economics student in the department. However, with their help, I have been able to refine my knowledge of economics so that I can view the world through an added lense. Finally, I’ve had a tremendous amount of support from my fellow members of the Fraternal Society. 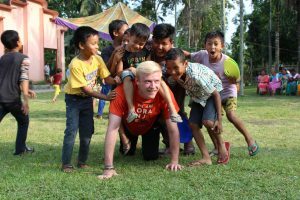 It’s safe to say the kids and I had a fun time at camp in Udalguri! 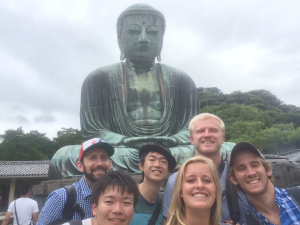 This summer I had the great opportunity to travel to both India and Japan, with the support of the Hope College’s athletic and kinesiology departments, to not only share my faith in Jesus Christ but also be immersed in new cultures through sports. In Udalguri, India, I helped run a sports camp for children. In Tokyo, I taught soccer. In each place, my fellow Hope College travelers and I were fortunate to meet a multitude of kind-hearted people with eye-opening and educational worldviews. In each place, my fellow Hope College travelers and I were fortunate to meet a multitude of kind-hearted people with eye-opening and educational worldviews. In India, we worked alongside Pastor Samuel, who travels around the state of Assam preaching at various Christian churches and making in-home visits to their members. 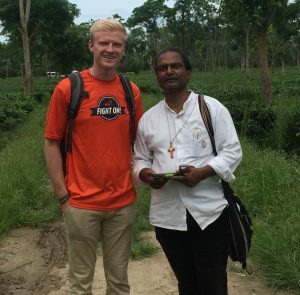 Throughout our time in Udalguri with the Boro people, he showed me what true passion for serving the Lord and seeking first His kingdom looks like. Pastor Samuel prayed with so much passion and energy. It was clear that he truly loved the Lord. Another aspect of Pastor Samuel that I admire is his desire to build up leaders from the community to serve others as the hands and feet of God. We met two of the many men and women whom he is mentoring as leaders across northern India. Bichan and Monoroma travelled with Pastor Samuel to be a part of his Gospel-spreading work in Udalguri that week. Because both of them speak English well, they struggle with deciding whether they should move to a big city to get a good paying job with a telemarketer company or staying in northern India with Pastor Samuel to spread the good news of Jesus Christ. In Japan, we toured Tokyo for two weeks as well as helped out at a local soccer camp run by Inter Milan and Technos College. This trip gave us the opportunity to see various temples and shrines, which are still culturally significant throughout Japan. Shun, a student from Technos, provided us a good deal of insight into the history and meaning behind everything we saw. His grandfather is the priest at the temple in his hometown. Buddhist traditions have been a part of his family’s life for generations. The kindness of a complete stranger is something we can all learn from and strive to improve in our own everyday lives here in the America. Everyone we met or encountered in Tokyo was extremely kind to us. Whether we were asking for directions, joking loudly on the trains, or taking random selfies with people by the Shibuya Crossing (the busiest crosswalk in the world), the Japanese people offered authentic hospitality constantly. So many people were willing to walk two miles with us even if we only needed him or her to walk one. The kindness of a complete stranger is something we can all learn from and strive to improve in our own everyday lives here in the America. I bring these lessons back with me to Hope thankful that I was able to experience God in new ways this summer. I am majoring in social work and would like to find a job overseas after I graduate. 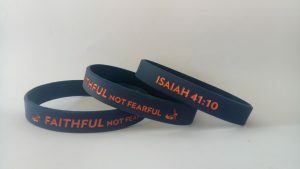 These trips have reaffirmed my desire to work with a faith-based organization in another country in the future. I thank Hope College for these two unforgettable trips that allowed me to experience new cultures, see places I never imagined I would see, meet kind people I’m glad I met, and to become a more global citizen in the process. Swedish ponies like selfies too! Looking for the best summer of your life? Look no further, because Hope College Geology summer research is where you will find it. Ponies, Swedish farmers, ROCKS. What could be better? But before I get too far ahead of my story, let me explain. 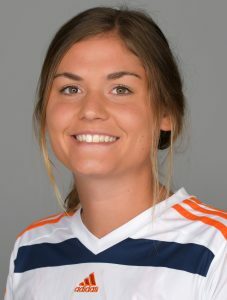 I am a geology major at Hope and also a member of the women’s soccer team (FIRE UP DUTCH!). 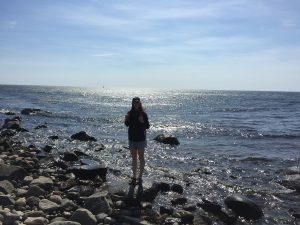 This summer, I was given the privileged opportunity to travel to Sweden to conduct research with Dr. Edward Hansen, professor of geological and environmental sciences and department chair, and fellow geology student, Max Huffman. This experience was unforgettable and formative too. We traipsed through pebble and shrub-filled fields and many dense forests in search of square-meter-sized boulders. Often, we only found moss and lichen-covered hillsides. But that’s what makes being a geology researcher fun; each day is a chance for a new discovery. 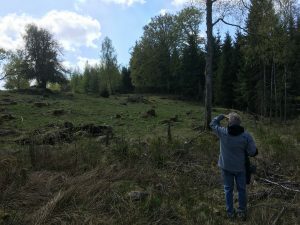 In Sweden, we were investigating a particular type of rock that once made up a large mountain range formed during a tectonic event, the Sveconorwegian orogen that occurred roughly 1.14-0.9 billion years ago. During this event, tremendous amounts of pressure made portions of the rock melt. Our goal in Sweden was to find outcroppings of these rocks (now very eroded) to observe the portions we hypothesize were part of this melt. So, a very large portion of our time was spent doing reconnaissance work, locating these outcroppings wherever they were scattered. This fieldwork was extraordinary but also very challenging. We traipsed through pebble and shrub-filled fields and many dense forests in search of square-meter-sized boulders. Often, we only found moss and lichen-covered hillsides. But that’s what makes being a geology researcher fun; each day is a chance for a new discovery. And on one of the best days, we discovered friendship with a farmer and his wife in their home. On this particular day, we needed to use a rock drill to sample a low-lying outcrop in a farmer’s pasture. The day before, our Swedish colleague called ahead to make sure the owner was willing to let us sample (and cause quite a bit of noise pollution). With approval, the next day we started drilling. A couple hours into the drilling process, the farmer’s neighbor came over to ask us about our project. He spoke English very well and wanted to tell his non-English-speaking neighbor (the farm owner) a little bit about the geology we were investigating. After briefing him on our project and showing him how to use the rock drill, the farmer invited us to come into his house for “fica” (the Swedish version of teatime). Five energetic farm dogs and his wife — who had prepared coffee, tea, and pastries — greeted us at the door. She even had fresh milk from the cows who had been watching us drill. It’s amazing that the experiences you never expect to have and the people you never expect to meet are the memories you know you’ll never forget. 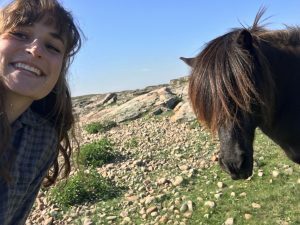 For about an hour, we sat with the farmer and his family, and his neighbors’ family too, in their home, learning a few Swedish words and talking about geology, dogs, movies, and horse racing (the farmer’s daughter was a professional horse trainer). It turned out to be the best day of field work, ever. It’s amazing that the experiences you never expect to have and the people you never expect to meet are the memories you know you’ll never forget. Plus, I returned to the United States with a new favorite Swedish tradition – fica, a time of restful communion. Rocks rock wherever you find them. These highly educational experiences are not rare at Hope. The geology program here focuses heavily on hands-on learning so we often take trips afield. In my three years as a geology major, I have traveled to the Upper Peninsula, Colorado, northern Kentucky, the Smokies, Arizona, and California to study various terrains and rock types. But being abroad this summer was most amazing of all, affording me an opportunity that most undergraduate geology students don’t usually get. Each opportunity gave me invaluable lessons and memories about something I love: the Earth. 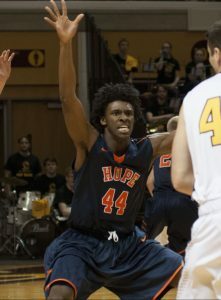 I’m not limited to one passion at Hope. I play soccer — a game I’ve loved since I was little — at a high level here, and I learn at a high level here too. So, what does all of this have to do with soccer at Hope? If there is one favorite thing I’ve learned through all of my Hope experiences, it is this: I’m not limited to one passion. I play soccer — a game I’ve loved since I was little — at a high level here, and I learn at a high level too. 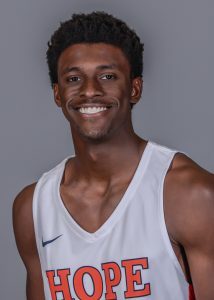 And, I am just one of many student-athletes who have been able to pursue their academic goals with gumption and not be limited by the demands of their sport. I have met so many other student-athletes who have been able to travel abroad for class work and/or research. In fact, my coach, Leigh Sears, wants us to take part academic adventures like these as much as possible and encourages our team to do so. 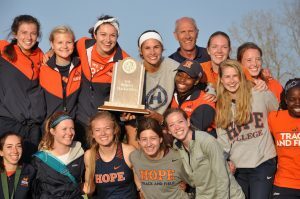 Every place I’ve traveled to as a geology student and every game I’ve played as a soccer athlete has vividly shown me that Hope College and the Hope women’s soccer program are designed to create future leaders of tomorrow, not just talented students and soccer players of today. That’s a combination that’s made my Hope experience rock solid! 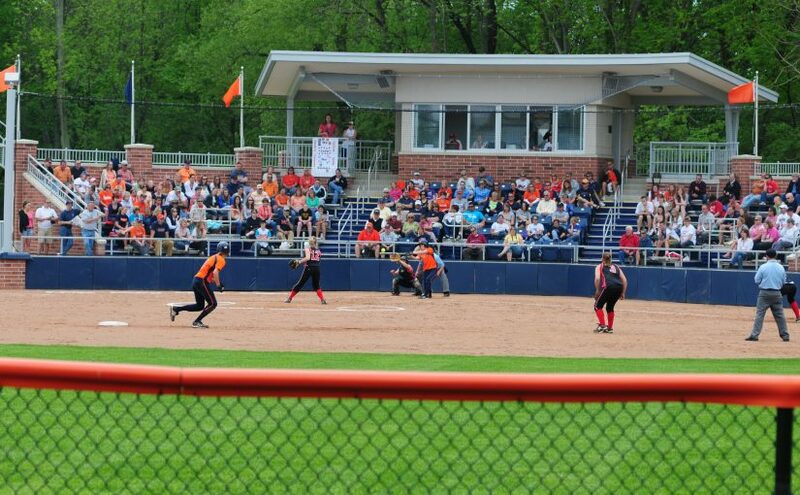 Over the course of two days this week, Hope College will host eight (maybe nine) softball and baseball games at Wolters and Boeve Stadiums. It makes for a lot of excitement for Hope players and fans, but it also makes a lot of work for the Hope grounds crew, those behind-the-scenes diamond denizens who maintain, prepare, and redo infields and outfields over and over to make them just right for all who play. But they aren’t complaining. In fact, groundskeeper Jim Speelman and his crew get a kick out of creating well-maintained and meticulously-groomed fields of green. While most of us simply show up at ball diamonds expecting the grass and dirt and white lines to look just so, rarely stopping to think about how they get that way, Speelman does stop and think about it. Everyday. Especially this Thursday and Friday when Hope hosts the two-day MIAA Softball Tournament and the final baseball doubleheader. The Flying Dutch softball team opens tournament play against Trine University on Thursday at 1:00 pm while the Flying Dutchmen baseball team will close their home season at 2:00 pm versus Adrian College on Friday. 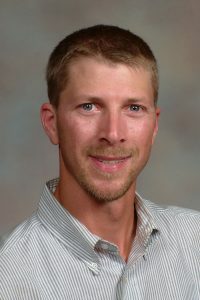 A 20-year veteran of the Hope grounds department who owned a lawn care business prior to arriving on campus, Speelman, who is now the president of the President of Michigan Sports Turf Manager Association (MSTMA), admits he never maintained or marked a ball field before coming to Hope. Last week, though, he conducted his third clinic for MSTHA’s members on infield maintenance. It gives him an opportunity to share his field wisdom as well as give back to the organization that taught him so much. It’s also a chance to showcase Hope’s two first-rate ball fields. At the clinic, Speelman discussed “brooming,” “dragging,” repairing, and irrigating. He talked about repair for profound wear around all bases and the pitcher’s mound. He enlightened on dirt texture and workability. And the man who knows each field’s topography like the proverbial back of his hand — Where the field dips a bit and hold more water? Where fielders trample down grass and dirt and leave pesky ruts? Where the drain lines are exactly? — imparted his philosophy on field upkeep and presentation recently, too. 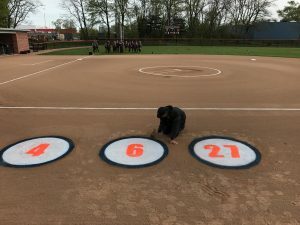 As added touches, Speelman makes handmade stencils so he can paint Hope logos or uniform numbers for Senior Recognition Days on the field. 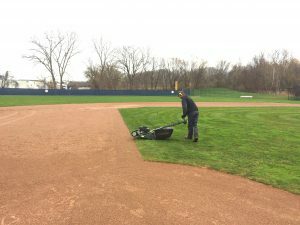 Additionally, he and his crew only have 20 minutes between doubleheader or tournament games to repack the pitcher’s foot plant area on the mound, fill in base paths or home plate holes, re-chalk batter-box lines, and re-drag the infield, but they want “the second game to start out as close to the same field conditions as when the first game started,” he says. Though unruly, complicated, non-spring-like weather adds layers to their work wardrobe and extra time to their workday, the grounds crew is still happy to provide a service they know makes a difference. They’ll gladly start their diamond day well before to the first pitch and remain well into the last game. Besides, it would be hard imagining any one of these guys sitting behind an indoor desk. The outdoors is where they feel called to be.